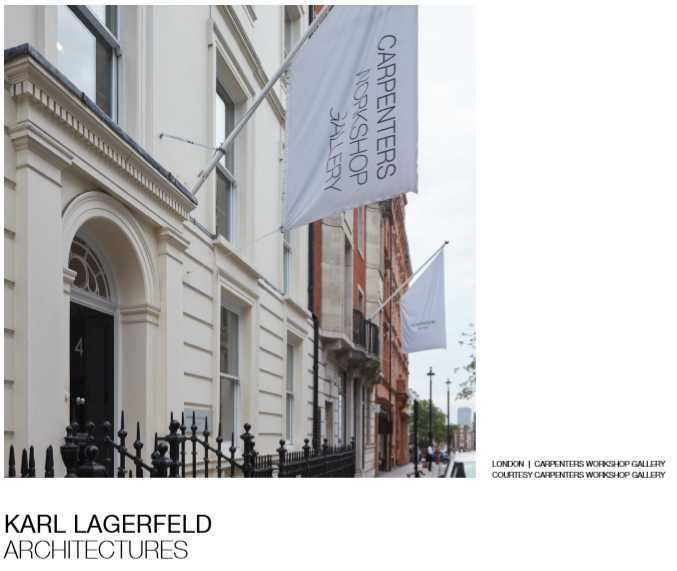 Carpenters Workshop Gallery | London, is pleased to introduce Karl Lagerfeld’s first ever sculptural works exhibition, Architectures, from 24th January to 8th March 2019. 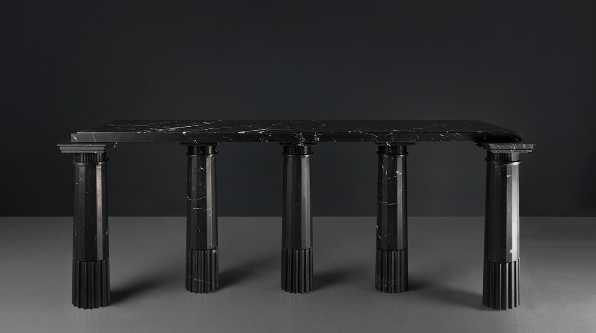 Evoking a contemporary architectural landscape with Greek origins, the unique pieces combine the precision of canonical proportions born from the use of the golden ratio and the most noble material, marble. The ensemble of gueridons, tables, lamps, consoles, fountains and mirrors materialize the perfect balance of classical foundations with a present-day vibe, like a modern mythology. 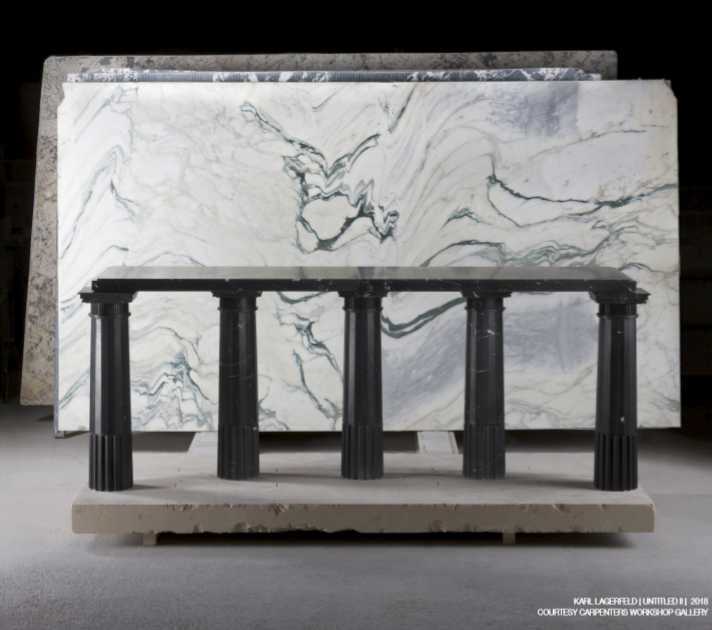 Each piece is carved from a carefully selected marble block, the Arabescato Fantastico, a rare vibrant white marble with dark grey veins which has not been quarried for more than thirty years, or black Nero Marquina marble, curated for its brush stroke-like, milky white veins. The combination of the material uniqueness with the timeless designs makes every piece exclusive. 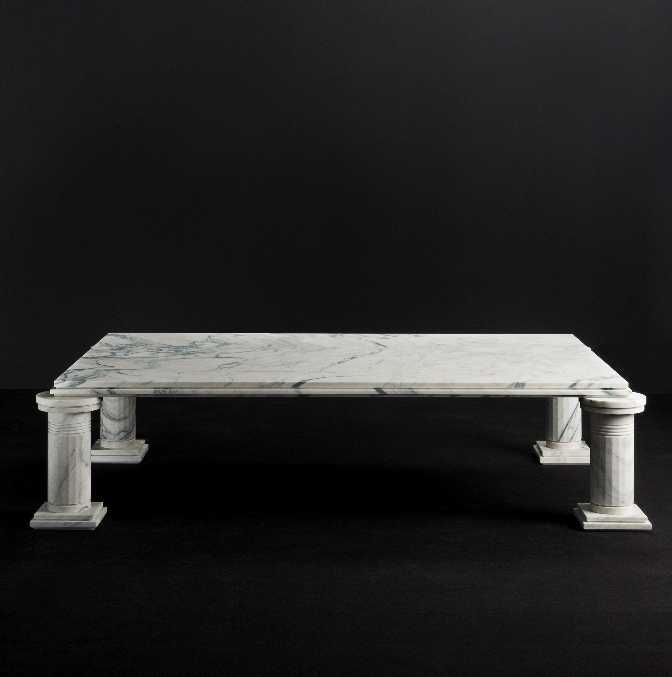 Only available as limited edition of eight pieces in each marble color, plus four artist proofs, each sculptural work is made with the special marble, which is then precisely cut, sculpted, faceted and polished in Italy by the best craftsmen, to achieve the vibrant exactness of the elements.The lighting works diffuse a specific daylight, the designer particularly appreciates, like a laser blade from the future. The shades of the table lamps are distinctively hand-painted in the most traditional technique of decorative arts, pushing the boundaries of craftsmanship and traditions. 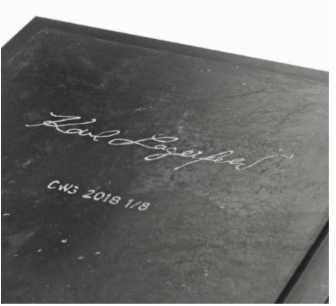 Shifting between the antique and the contemporary, the icons of classics and the finest present skills, the black and white architectonic creations embody Karl Lagerfeld’s timeless monochromatic style. The architect Aline Asmar d’Amman carried out the studies and the development of the works created by Karl Lagerfeld. All the works in the Architectures limited edition stay true to Carpenters Workshop Gallery’s passion for blurring the boundaries between contrasting disciplines of creativity, art, design and fashion. From Functional Art to Collectible Design, today Carpenters Workshop Gallery produces and exhibits functional sculptures by international rising and established artists or designers going outside their traditional territories of expression. Actively involved in the research and production of limited edition works, the gallery’s choices are guided by seeking an emotional, artistic and historical relevance; a relevance that must appear evident. In 2015, the gallery opened The Workshop in Roissy, a unique 8,000 square meters space dedicated to artistic research, bringing together the elite of artisans, an homage to the French heritage of ‘Arts Décoratifs’. The gallery relies on the partnership of childhood friends, Julien Lombrail and Loic le Gaillard. They first opened a space in London’s Chelsea in 2006 in a former carpenter’s workshop; they now operate four galleries globally in London, Paris, New York, and more recently in San Francisco. Fashion icon Karl Lagerfeld is globally renowned for his cutting-edge, aspirational and relevant approach to style. As one of the most celebrated fashion designers of the 21st century, his visionary creativity expands beyond fashion to include illustration, photography, interior design and publishing. In addition to be the creative director of the Chanel and Fendi fashion houses, he is also overseeing the creative direction of his signature brand, KARL LAGERFELD. Aline Asmar d’Amman is the architect and interior designer behind Culture in Architecture, a design studio based in Beirut and in Paris, with international projects ranging from high end residential to luxury hospitality and bespoke furniture. Seeking spaces with an intense resonance, Culture in Architecture cultivates narrative statements born from intricate dialogs between the raw and the precious, with a specific attention to the use of primary stones and handcrafted materials, heritage and innovation, borrowing constant inspiration from the art and fashion world to every creative expression. Recent realizations include the art direction of Hôtel de Crillon’s renovation, the interior design of the palace’s historical salons and suites, as well as a collaboration with Karl Lagerfeld on his ‘Grand Apartments’ decor. Aline Asmar d’Amman was recently awarded the interior design project for the iconic Jules Verne restaurant located on the second floor of the Eiffel Tower in Paris with Michelin star acclaimed chef Frédéric Anton and the Sodexo group. 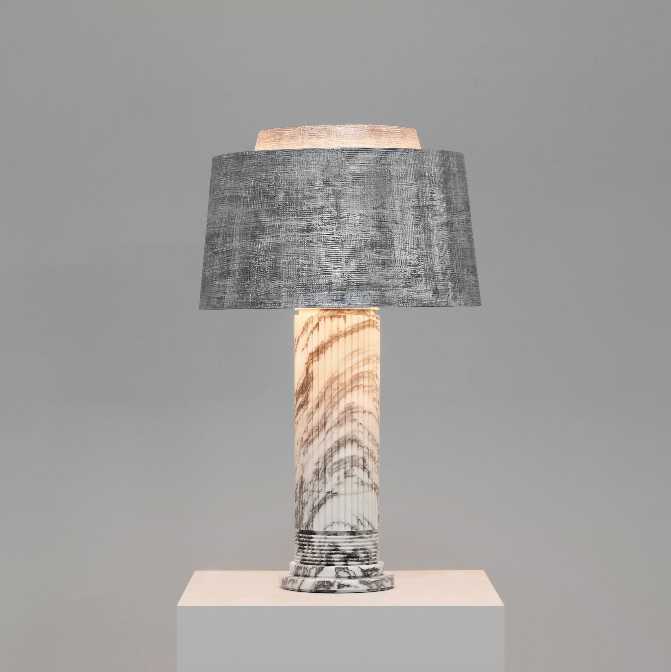 The creative dialogue with Karl Lagerfeld has led her to carry out the studies and the development of his functional sculptures, Architectures, a collection created by the designer and exhibited at the Carpenters Workshop Gallery. © Chic and Style Limited 2000 - 19. All rights reserved.